Believed to be an incarnation of Shri Dattatreya the name of this spiritual master, popularly called Swami Samarth, is a household word in Maharashtra and the region around. As this Perfect Master chose to reside at a place called Akkalkot for 22 years where he took Mahasamadhi (left his mortal body) in 1878, he is also known as the Maharaj of Akkalkot, Akkalkot is situated in district Solapur of Maharashtra state of India. For the devotees of Shri Shirdi Sai Baba, it would be inspiring to learn about the life and deeds of ‘Swami Samarth’. A comparative picturisation of the lives of these two great Saints, i.e. Swami Samarth and Shri Sai Baba of Shirdi would establish a surprising amount of commonness in their lives and deeds which includes their methods of teaching, the universality of their approach and the miracles they performed. Even a critical approach by a non-conformist would ultimately lead to the assertion that the over-all role of these two spiritual masters during the second half of the nineteenth century was similar, if not same. One, who is capable of making finer spiritual analysis, would be faced with a bewildering reality. The reality is that Swami Samarth and Shri Shirdi Sai Baba were the manifestations of the same Divine Spirit in two gross bodies. Many published writings on both these Saints by different writers authenticate about the interaction between these two Sadgurus both in the gross, and the subtle planes. Just before Mahasamadhi, Swami Samrath advised one of his disciples to worship Shri Sai at Shirdi saying that he (the Swami Samarth) would stay at Shirdi in future. The early life of Swami Samarth like that of Shri Shirdi Sai Baba is shrouded with mystery. For that matter, even Shri Shirdi Sai Baba’s advent and early life has not been established. Yet it does not really matter for those who have faith in Him and continue to experience his benevolence in different ways. How does it matter if Christ was born of a virgin mother! He took the pain of the suffering humanity and led them in the path of spirituality. That is what the world needs. Shri Narasimha Saraswati, about three centuries before the advent of Swami Samarth is believed to be the earlier incarnation of Shri Dattatreya. The ‘Guru Charitra’ one of the most famous books gives lot of information about Him. As per the most popular belief, Shri Narasimha Swami, after helping and spiritually uplifting a large number of people over a few decades, went away to the Himalayas for penance and went into Samadhi. In the Samadhi state He remained for about three hundred years. With the passage of time a huge anthill grew over him and he was lost to the outside world. One day accidentally a woodcutter’s axe fell on the bushes grown around the ant hill. He was shocked to find blood stains on the blade of the axe. He cleared the anthill and Lo, he found a Yogi in meditation. The Yogi slowly opened his eyes and consoled the dumbfounded woodcutter saying that it was the Divine Will for Him to re-appear in the world to resume His mission. This Yogi, in his new role came to be known as Swami Samarth. What we call miracles are the normal ways of functioning of the God realised ones. The Risaldar of that area, a Muslim person, wanted to test the Swami by offering him a ‘Chilum’ (an earthen smoking pipe) without tobacco in it and asked him to smoke. Swami Samarth started smoking the empty Chilum after lighting it as if nothing had happened. Realising him to be an advanced spiritual person, the Risaldar apologised and made arrangements for his stay in the house of one Cholappa. It is in this small house that Swami Samarth lived upto his last. He treated Muslims, Christians and Parsees all alike. His Kindness was always bestowed on the poor, needy and the people at the lowest rung of the society. Both Hindus and Muslim festivals like Dusshehra and Moharram etc. used to be celebrated by Him. As in Shirdi, Thursday became a special day of celebration at Akkalkot. Like Shirdi Sai Baba, Swami Samarth of Akkalkot was fond of mass feeding. Once, on his visit to a place called Rampur, a devotee named Rawaji, to celebrate his visit, cooked food for 50 people. However, hearing the news of Swami Samarth’s arrival hundreds of people from the neighbouring villages started rushing to the village. Seeing such a large number of people at his doorstep Rawaji became visibly panicky. Moved by his plight, Swami Samarth asked Rawaji to get some empty baskets. When the baskets were brought from the market, idols of all the deities like Khandoba, Annapurna, etc were put in them and food materials like chapatis (bread) etc. were piled over them. Bawaji and his wife were asked to carry these baskets and take three rounds around the Tulsi plant. After that, they were asked to serve food from these baskets to the guest without looking into them. When food were being served, Rawaji and his wife were amazed to see that the baskets never exhausted even after a few hundred people had been served. After all the people who had come finished their meal, Swami Samarth took his meal. This is known as ‘Annapurna Siddhi’. Swami Samarth had the capacity to read the minds of all the people coming to him and also was able to know about their past and future. Baba Saheb Jadhav, one of his great devotees one day came to meet the Master. Seeing him suddenly Swami Samarth said “Oh Potter! There is a summon coming in your name”. The potter being in the close circle of Swami Samarth understood the meaning of this sentence and begged of the Swami to save him from the approaching death so that he could continue to serve him (the Master). Moved by his devotion Swami Samarth looked-up towards the sky and muttered something as if he was addressing to someone who was invisible. Suddenly, he pointed his hand towards a bull passing nearby and said in a loud voice “go to the bull”. In the presence of a large number of devotees, the bull instantly fell dead. Jadhav, with a fresh lease of life, devoted himself totally to the service of Swami Samarth thereafter. Similarly, An European engineer from Solapur visited the Swami with the earnest hope of having a son. As he approached Swami Samarth, the latter just looked at him and told that he would have a son within a year. That is what exactly happened. The Sadgurus or the Spiritual Masters always endeavors to change the quality of men that encounter them. Besides bestowing material benefit, they try to uplift them spiritually. Once a Jewish doctor, who was working as an eye specialist in the J.J. Hospital, Bombay met Swami Samarth. The doctor was very proud of his professional competence. Seeing him Swami Samarth asked “tell me doctor, how many of the eye patients you have treated have lost their eye sights for ever”‘. This sentence made a tremendous impact on the doctor. He realised that many people had lost their sights forever even if they had been treated by him. His ego immediately vanished and thereafter he became a devotee of Swami Samarth. After retirement the doctor settled-down at Akkalkot and served the Master till his last. After serving the poor, curing the sick and helping the spiritual seekers over a few decades, Swami Samarth one day suddenly announced that the time had come for him to go out of his physical existence. By Hindu calendar It was Chaitra Sudha trayodasi, Shaka 1800 i.e. the year 1878 AD Tuesday at 4 PM. At this time he seated himself in Padmasana (Lotus Posture) and uttered his last words – “No one should weep I shall always be present at all places and I shall respond to every call of the devotees”. Shri Sai Baba of Shirdi had also said exactly the same thing before his Mahasamadhi. Just before he had left his gross body, one devotee named Keshav Nayak who was emotionally charged, asked “Maharaj, since you are going, who will give us protection?”. 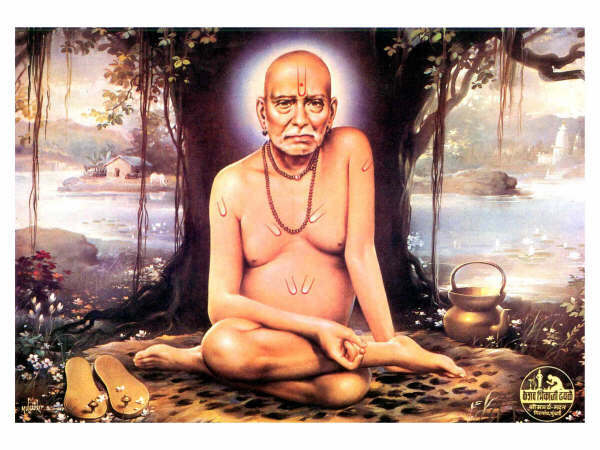 Swami Samarth gave him a pair of his sandals to worship. He told him “In future I will be staying at Shirdi in district Ahmednagar”. Another devotee, Krishna Ali Bagkar decided to go to Akkalkot and worship the padukas of Swami Samarth. Thereafter he got a dream appearance of Swami Samarth who told him “Now I am staying at Shirdi, go there and worship me”. Bagkar went to Shirdi where he stayed for six months. Later, when he wanted to take leave of Shri Sai and go to Akkalkot again Shri Sai told him “what is there in Akkalkot, Maharaj of Akkalkot is staying here”. Bagkar realised that there is no difference between Swami Samarth and Shri Sai Baba of Shirdi as he recalled his earlier dream. The divine game (leela) of Swami Samarth did not end with his Maha Samadhi (shedding his mortal coil). His devotees continue to experience the miracles of his visible and invisible help even till today. It is exactly like the experience received by the devotees of Sai Baba of Shirdi after his Mahasamadhi in 1918. Many people have authenticated his appearance in physical form before them. These people are not the faith-blind rural folk. Many of them are well educated people like doctors, educationists etc. For example, Dr. S.V.Marathe, a private medical practitioner of Pune once underwent treatment in a chest Hospital at a place called Aundh in 1964. Many of his friends were anxious to come and visit him. At this juncture, Swami Samarth appeared before many of his friends in a dream and gave the same message to all of them. He asked them not to worry about Dr.Marathe, as he was under His (Swami Samarth’s) protection and also not to come to Aundh. Hundreds of devotees continue to have miraculous experience about the Perfect Master even today. But his miracles and those of Shri Sainath are so alike that one would be drawn to the conclusion that they are not two masters but are one, and the ONLY ONE TRUTH.